"It's our life. It's our family's life!" The Orchard has debuted a new poster and trailer for the upcoming US release of Joachim Trier's indie Louder Than Bombs, which played at the Cannes Film Festival last year. Jesse Eisenberg stars as Jonah, along with Amy Ryan, Gabriel Byrne, David Strathairn, Devin Druid and Isabelle Huppert. The film is about how two boys cope with growing up after their mother is killed in a car crash, which is shown in vivid detail in this trailer and in the film. There's something very emotionally appealing about this, I'm not sure what it is, but every single trailer draws me in. Maybe it's just the way Isabelle Huppert walks around… I'm still looking forward to catching this soon. Take a look below. An upcoming exhibition celebrating photographer Isabelle Reed three years after her untimely death, brings her eldest son Jonah back to the family house – forcing him to spend more time with his father Gene and withdrawn younger brother Conrad than he has in years. With the three of them under the same roof, Gene tries desperately to connect with his two sons, but they struggle to reconcile their feelings about the woman they remember so differently. 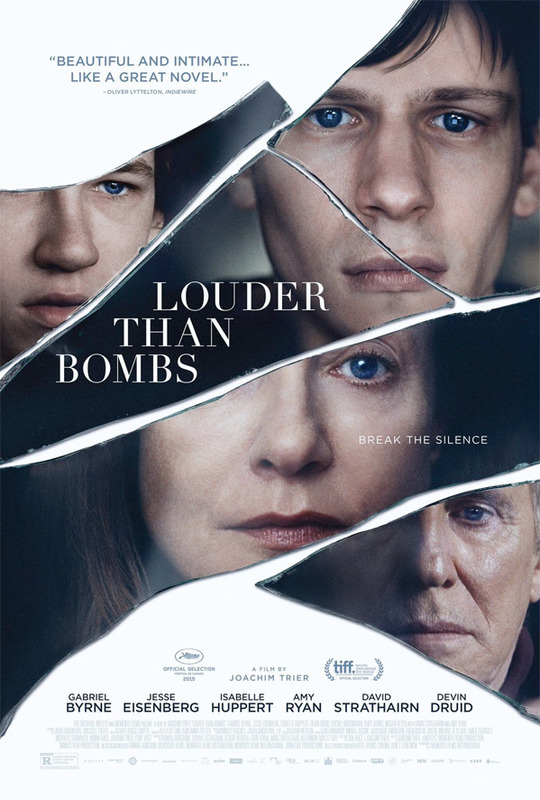 Louder Than Bombs is directed by Danish filmmaker Joachim Trier, of the films Reprise and Oslo, August 31st previously. The script is by Joachim Trier and fellow filmmaker Eskil Vogt. This first premiered at the Cannes Film Festival last May in competition, and will be released by The Orchard. Louder Than Bombs opens in select theaters on April 8th, plus on VOD this July. Good trailer. Will be watching. It's a second trailer and it still looks good. I'm very glad to see G. Byrne after a long time. Looks very interesting. I'll be looking for it to play near me.